It's a double dose of nostalgia: Director-choreographer Joshua Bergasse's lively revival of Smokey Joe's Café: The Songs of Leiber & Stoller should please fans of the titular songwriters as well as lovers of the 1995 Broadway revue, which closed in 2000. Even if you don't recognize Jerry Leiber and Mike Stoller's names, you certainly know their work: The duo penned more than 70 chart-toppers in the '50s and '60s, including enduring hits for Elvis Presley ("Hound Dog," "Love Me"), the Drifters ("On Broadway"), the Coasters ("Charlie Brown," "Yakety Yak"), Peggy Lee ("I'm a Woman") and Ben E. King ("Stand By Me"). All of those songs and about 30 more are exuberantly performed by a cast of nine performers, who belt, boogie and beam with the stamina of Energizer Bunnies. As a showcase for Leiber and Stoller's breathtaking range (blues, rockabilly, R&B, rock & roll, doo-wop), Smokey Joe's Cafe is aces. If only the production, which originated at Maine's Ogunquit Playhouse, had as much stylistic variety. 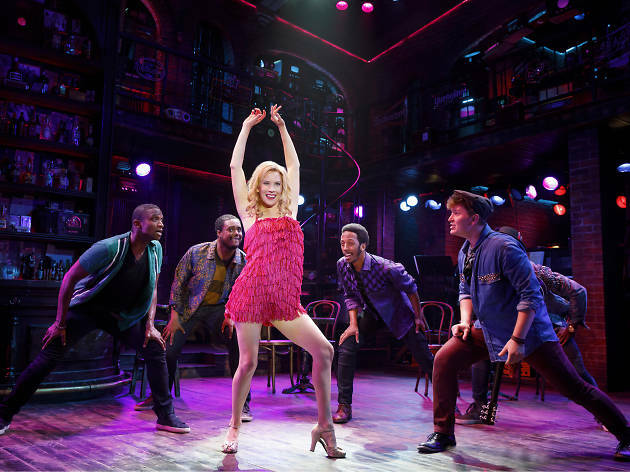 The ensemble cast's vocal and dance skills are impressive, and the eight-member band sounds hot; but although the musical is entertaining, it is rarely emotionally engaging. This is partly due to the absence of a narrative—there are no characters or dialogue—but also because the performers are too busy adding American Idol-style ornamentation to Sonny Paladino's arrangements and executing Bergasse's challenging choreography to focus on the nuances of acting. Only Alysha Umphress knows how to consistently turn these songs into self-contained stories, seducing us as a bad girl prone to "Trouble" and breaking our hearts with the dashed dreams of "Pearl's a Singer." Standout moments include Jelani Remy's athletic interpretation of "Jailhouse Rock," Emma Degerstedt's mesmerizing moves on "Teach Me How to Shimmy," Dionne D. Figgins' comical search for love in "Dance with Me" and Max Sangerman strumming a guitar while crooning "Ruby Baby." Remy, Dwayne Cooper, John Edwards and Kyle Taylor Parker deliver tight barbershop-quartet harmonies throughout. As a clap-along experience for theatergoers of a certain age, Smokey Joe's Cafe serves the right stuff. But those looking for heartier fare may leave feeling hungry. Stage 42 (Off Broadway). Lyrics by Jerry Leiber. Music by Mike Stoller. Directed by Joshua Bergasse. With ensemble cast. Running time: 1hr 40mins. No intermission.